Today i am sharing with you an easy to make tasty side dish for roti and parathas. I have learnt this curry from my mother in law. She makes this curry for the dinner with chapatis. I rarely use coconut milk or cream in this recipe. Because without that itself the curry tastes awesome. It is a healthy protein rich curry perfect for diabetes patients too. It is a tasty curry made with the ingredients already available in our pantry. This would be definitely a satisfying and also a filling side dish. If you use dry peas soak the peas overnight or minimum 6 hours and pressure cook them with salt for 2 whistles on medium flame. If you use frozen peas thaw them before hand. For fresh peas add some water and salt; cook them for about 5 minutes. Heat oil in a pan and add the cinnamon, clove, cardamom and jeera. Once the roasted aroma arises add chopped onion with a pinch of salt and cook till soft. Now add the ginger garlic paste and cook till the raw smell leaves. Add the chopped tomatoes and cook till it becomes mushy. Add the capsicum and cook for 2 minutes. Now add turmeric powder, chilli powder, coriander powder and garam masala powder and cook for fifteen seconds. Add a cup of water and salt. Close with a lid and bring it to boil. Now add the cooked peas and add some water if needed and mix well and close with a lid and cook well. Now itself the curry tastes awesome with rotis and ready to serve. If you like to make the curry more creamy add some cream or some coconut milk and switch off the gas. Garnish with some chopped coriander leaves before serving. Note: For variation you could add some kasuri methi before switching off the gas. You could use fresh thick creamy yogurt instead of cream. 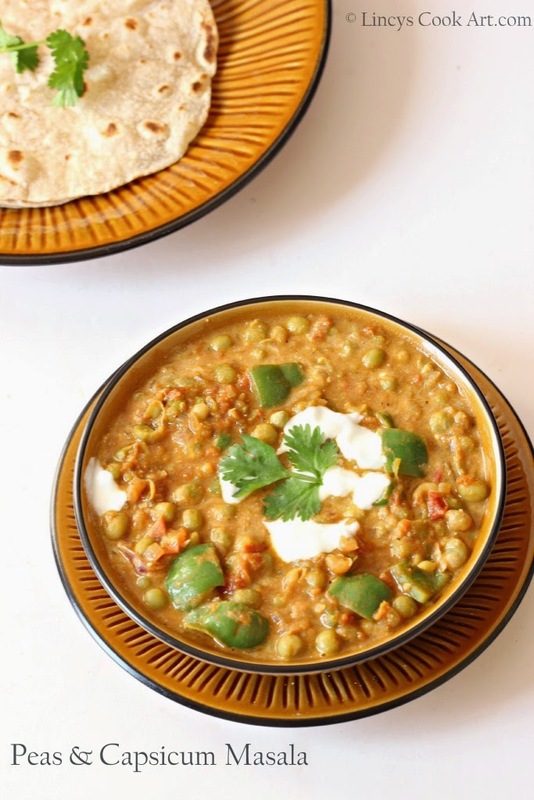 never tried peas and capsicum combo.. curry looks delicious..